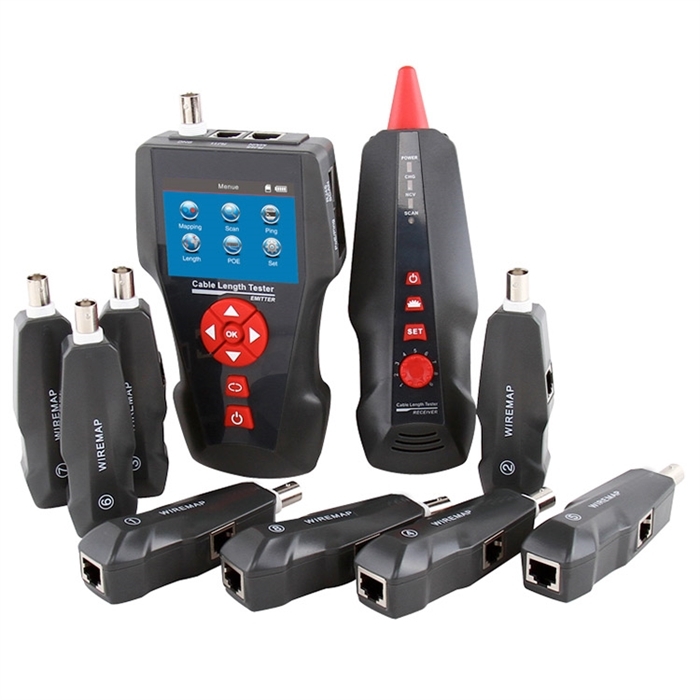 We know that there are a lot of choices for network testers which can make it extremely tough to find which one to invest your hard earned money on. Let us help - buy this one. 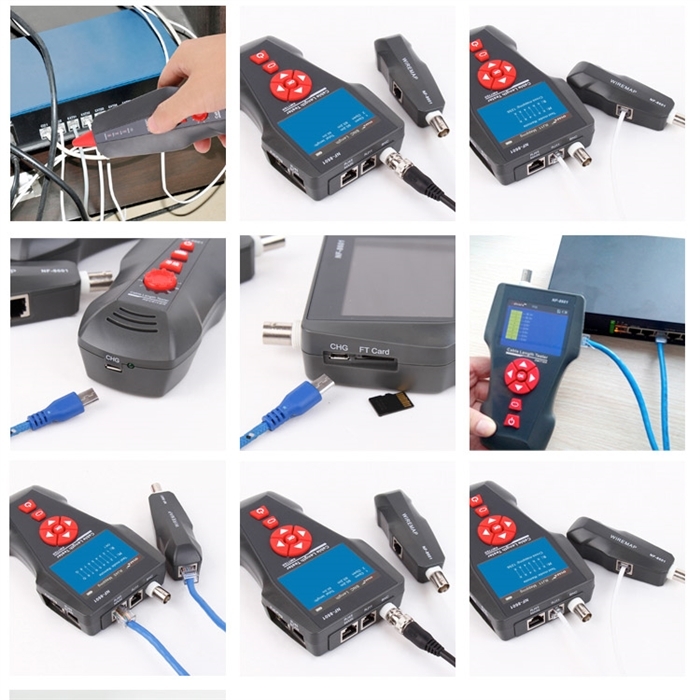 While this unit does not certify cables, it does just about everything else including checking for Mis-Wires and Shorts, POE, Ping, Map, Cable Length, Tone/Probe, Voltage Detection, and a flashlight. Best of all it is half the price of competing models, and it is so simple to use. The 8601 Main Unit and Scan Probe are both rechargeable via a micro USB port. While it is a small feature, we really liked that all 8 Remotes have an audible tone when the Main Unit locates them in Map Mode. Map Mode: This kit comes with 8 remotes, numbered 1-8. Each remote has a RJ45, RJ11, and BNC connector making it extremely versatle with multiple wire and cable types. The BNC can be adapted to virtually anything (including F) using optional adapters. For any one unfamiliar with mapping, the logic is to install the remotes in up to 8 different locations, and use the Main unit at the head-end to identify which wire is going to each location. Where the 8601 really shines is its ability to map and test wiring at the same time. When a remote is found, it will show you if the wire or cable is wired correctly, cross-wired, shorted, and virtually any other type of mis-wire. Scan Mode: If you need to follow a wire, or figure out which port on a switch it is connected to, the Scan Mode is just what you're looking for. Connect the main unit to one end, put it in Scan Mode, and then use the included Probe to follow your wire. The Probe offers both a visual and adjustable audible tone when you've located the wire connected to the main unit. Ping Mode: In addition to testing the physical network, the 8601 also includes an important hardware troubleshooting tool - pinging. So far the product has performed well. A few NECESSARY connectors and a short coax cable would have been nice to have included. It's like buying a set of tires but the air wasn't included. This tester does a lot of things more expensive testers do. I've only used it for Ethernet testing. You can do everything from continuity testing of cables to pinging IP addresses on your network. It has saved me hours of time troubleshooting problems. My only gotchas on this device... There are 3 RJ-45 jacks- you have to be plugged into the correct jack when you perform a test otherwise the test will fail. If you don't remember this, you will think you have a problem when you might not- remember to move your testing cable to the correct jack when you change tests. The 8 little tester remotes work as advertised and beep when the cable under tests passes. Great way to label and identify eight cables at a time and save a ton of time. I've had this unit about 2 weeks and it has paid for itself in time saved ten times over already. I have not had time in the field with this yet. Testing in the shop is very positive so far. The rechargeable battery is a nice feature and the tracing abilities seem very good. A versatile tester with a nice screen. Looking forward to using in the field. So far, this Product Review was helpful to 2 TTS Customers. The Color Network Tester Kit Map / Scan tool works great. I now have 3 so my tech don't take mine. very happy with unit. Fast delivery to Australia. took only three days. only problem was the unit came with no instructions. Half the devices were unwrapped in side. I would say the unit has been opened prior to being shipped. I am still happy and not worried about this.